Dimensions 1.74 by 6 by 9 in. 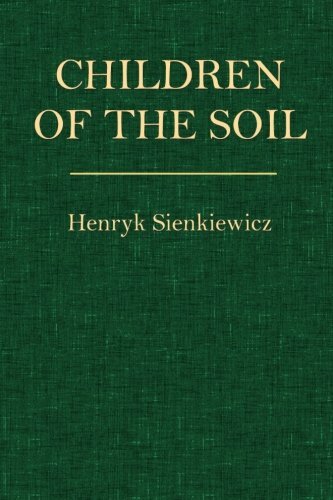 THE title of this book in the original is Rodzina Polanieckich (The Family of the Polanyetskis); Ã¢ÂÂChildren of the SoilÃ¢ÂÂ has been substituted, because of the difficulty of the Polish title for American and English readers, because the Polanyetskis are called children of the soil in the text of the volume, and because all the other characters are children of the soil in the same sense. For most readers this book will have a double interest,Ã¢ÂÂthe interest attaching to a picture of Polish life, and the general human interest inseparable from characters like those presented in the narrative of Pan StanislavÃ¢ÂÂs fortunes. The Poles form a part of the great Slav race, which has played so important a rÃÂ´le in the worldÃ¢ÂÂs history already, and which is destined to play a far more important one yet in the future. The argument involved in the career and meditations of Pan Stanislav is of interest to every person in civilized society; it is an argument presented so clearly, and reinforced with such pointed examples, that neither comment nor explanation is needed. Were it not for the change of title, I might escape even this brief statement; but now I may add that the following translation was made in many places, in different countries, at various intervals, and at moments snatched from other work. I began Ã¢ÂÂChildren of the SoilÃ¢ÂÂ in Cahirciveen, Ireland, and continued it in London, Edinburgh, Fort William near the foot of Ben Nevis, Rome, Naples, and Florence, Tsarskoe Selo, Russia, and South Uist, an island of the Outer Hebrides. From the Outer Hebrides I was called home before I wished to come, and left that little granite kingdom in the Atlantic with sincere regret. The translation was finished in Warren, Vermont, and revised carefully. To new readers of Sienkiewicz I may state that Pan, Pani, and Panna, when prefixed to names, mean Mr., Mrs., and Miss respectively.